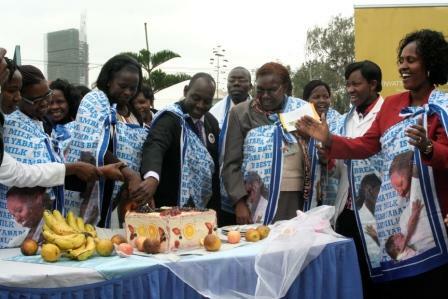 Yesterday I was at the Kenyatta National Hospital attending celebrations to mark the World Breastfeeding Week. As you know by now, I hold breastfeeding very close to my heart because I totally get the benefits of breastfeeding. 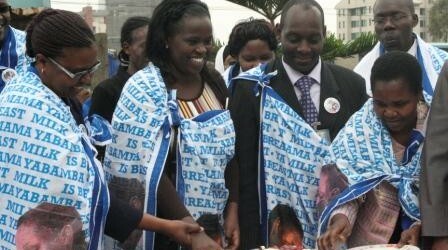 So yesterday I got to hang out with nurses and breastfeeding supporters based at KNH. I must say that for once, I was glad the event started late –it was supposed to start at 9.30am but it started at 11am (I am tempted to say that that is typical of government functions but I shall not say it). I say I was glad because I arrived for the function at 10.55 am (I am tempted to say that of late I have been practising alot of African timing but I shall not say it). 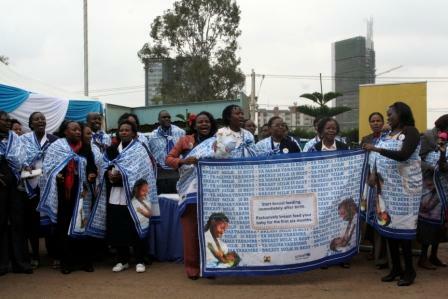 The event started off with the KNH breastfeeding choir belting out tunes themed on breastfeeding. 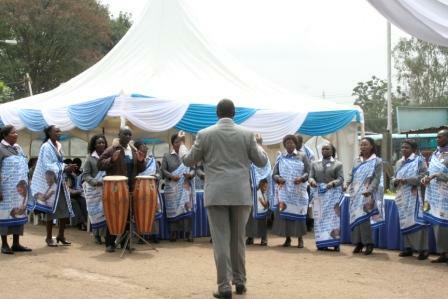 Reminded me of Muungano choir. Then there were the usual speeches that begin with …ladies and gentlemen, honourable guests …. all protocols observed ….. it is my great honor…..
Then there was the highlight of the event, which was a speech by a newbie in the current parliament, Hon. Sarah Paulata Korere (very cool name). I enjoyed her speech. Because it was mainly off the cuff –not those written speeches that are so disconnecting with the audience. She’s a good narrator this Hon. Korere (still being jazzed by that name). 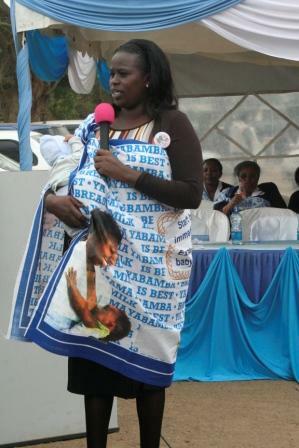 She talked of how when she was recently being sworn in as a Member of Parliament, her baby was only 3 weeks old. And that it became extremely difficult to balance the rigors of a hectic bunge schedule, meeting her constituents (she’s nominated by the way but serves her constituents nevertheless) and taking care of her infant. At some point, the stress was too much and she wondered what to do with her baby because she just couldn’t keep up with ‘breastfeeding on demand’. So she opted for formula milk. But just as she was about to feed her baby formula, she on second thought consulted a lactation manager, who took her through the A – Z of expressing and storing breastmilk. She actually amused the audience when she said that she didn’t know that it was possible to express and store breastmilk. Having learnt that, she disposed the idea of formula milk, and is proud to say that she’s today managed to keep her baby purely on breastmilk. 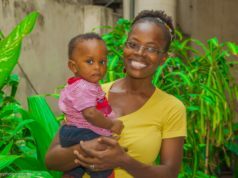 She carries her baby to parliament with her and keeps taking breaks from parliamentary proceedings to go nurse baby. 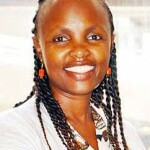 I must meet this mheshimiwa for a one-on-one interview on just how this has been working for her –knowing how many of the male peoples in parliament tend to be very unfriendly to issues concerning their female colleagues and women in general. Atleast that’s how previous parliaments have been. I didn’t get time to ask her that yesterday because she was travelling out of town, but since I took down her contacts, I’ll set up an appointment with her and let you know. 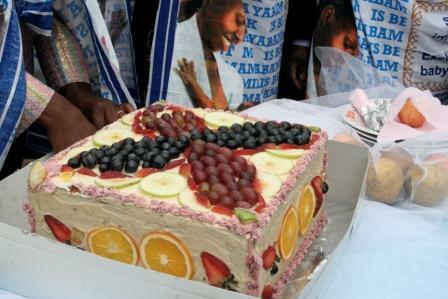 Haya, after her speech, it was time to cut the ‘breastfeeding cake’ basically meant to celebrate the breastfeeding week. Now this cake was an interesting one because I understand that it was made of only ‘healthy ingredients –I didn’t get what that meant, but what I caught was that it didn’t have alot of sugar and icing. Here, have a look at it. Since Hon. Korere was the guest of honor, she’s the one who did the cake cutting –assisted by many other hands. It was passed round like the way it’s done at weddings, and it tasted good –it was fruity. After that, the function was over, but not before the organizers made sure that our stomachs had a little fill. Which was good because as you know, I am nursing my 4 month old son, and I am PERMANENTLY hungry. The function ended at about 1.15pm so the bitings really did me good. The bitings were a packet of 250 ml milk (how appropriate), a mshikaki, a small sweet banana and a half tomato sandwich. I ate them happily and was good to go. For me, the only miss was that they didn’t have some breastfeeding moms besides Hon. Korere to also share their experiences. I asked one of the organizers why this was so, and he told me it’s because the weather was very cold and they didn’t want to expose babies to this (the function was outdoors –next to the main KNH bus stop). Actually maybe I should have shared my experiences. Oh, another miss was that the whole function was to launch the ‘Breastfeeding Support Group’, but I left the function abit vague on the group -what it will do, who will be in the group, and how they will go about supporting breasfeeding moms. So I took down the contacts of one of the organizers, a lady called Agnes, and told her I’ll call her up so that I can get more of this information as I’m sure it can benefit not only myself, but also some of you and your sisters, cousins, friends, colleagues etc. Yeah, so that was it. I then quickly rushed back home to eat a real meal plus ofcourse to nurse baby Ello and play with Kitty. Have a lovely long weekend ahead and Eid Mubarak to all our Muslim relatives and friends.